Economists have gotten a bad rap for failing to predict downturns like the recent recession. But innovation—not soothsaying—is their job. 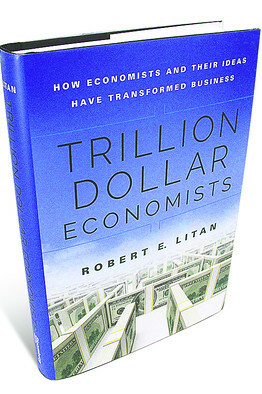 To nonexperts, as Mr. Litan notes, economists often seem to be enablers of bad policy—at the Federal Reserve, on Capitol Hill, or within regulatory agencies and financial firms. Given their expertise, it is thought, economists should be able to protect us from downturns like the recent one. Mr. Litan’s tour highlights the wonky economic ideas that have markedly improved the lives of average Americans. A phenomenon known as artificial scarcity, for example, occurs when suppliers limit availability or raise the price of a product that might otherwise be plentiful or inexpensive. Application of this concept, as recommended by the economist Muriel Niederle, fixed a problem at the dating site Cupid.com. Male customers were barraging females with so many requests for dates that the females couldn’t decide which suitors to meet. Then, on advice from Ms. Niederle and her colleague Dan Ariely, Cupid.com limited the males to two approaches a month. Constrained, men revealed more about themselves and targeted more carefully. More successful matches were the result. The economist Alvin Roth focused on matching of a different sort. Americans and Britons who needed kidney transplants had long tried to find a loving spouse or sibling willing to donate a kidney. But donor compatibility proved so rare that such offers were of little use. Mr. Roth and his colleagues noted that more matches would be possible if the data on willing donors, available kidneys and patients were pooled and sorted, creating a clearinghouse. This system has facilitated hundreds of transplants that otherwise might not have occurred. Energy is the area where economists have had their greatest effect in recent years. Long ago, they had drawn supply and demand curves showing that price controls and government regulations limited supply, but they were compelled to make the case again after an era of heavy government interference in the economy. Eventually economists’ logic did drive a Democratic president, Jimmy Carter , to partner with Congress in dismantling crude-oil price controls. Economists’ evidence likewise made Congress pass the Natural Gas Wellhead Decontrol Act of 1989. The freeing of various energy sectors created the potential for greater profits, which in turn goaded entrepreneurs and engineers to undertake remarkable technological innovations, such as fracking. The result: an area of growth in an otherwise spotty economy and the possibility of the formerly unthinkable transformation of the U.S. from needy importer to robust energy exporter. In such portraiture, Mr. Litan evokes admiration for his beleaguered brethren. But of course most economists aren’t really underdogs in need of defending. Taken together, they constitute a classic phenomenon, one to which the otherwise comprehensive Mr. Litan gives short shrift: the guild. The economists’ guild, like others, insists on adherence to a particular methodology and set of beliefs—in this case, the standard understanding of macroeconomics, with its emphasis on Keynesian categories and government-fueled aggregate demand. The guild operates with an unofficial but real license from the banks and the federal government. When it comes to Washington policy, macroeconomists shut out innovative colleagues, some even of the sort Mr. Litan celebrates. The ruling macro-theorists, for instance, demonstrate an annihilating contempt for the Austrian School, which focuses more on individuals than aggregates. The same contempt is directed at Public Choice Theory, which predicts that governments will take advantage of market crises to expand in nonmarket sectors. Scholars from these schools do not win top positions at the Fed or at major universities and firms. Such guildthink is what proved fatal just before 2008 and after. There were no Public Choice School theorists at the White House or powerful institutions to warn that there might be a housing bubble if government expanded its presence in the housing sector. Few elite economists warned that the administration might use a financial crisis to undermine bankruptcy precedent or socialize health care. Ironically, analysis by economists demonstrates the inefficiency of guilds, yet these scholars perpetuate their own. Until that changes, go ahead and blame the economists. Miss Shlaes chairs the board of the Calvin Coolidge Presidential Foundation and serves as presidential scholar at the King’s College. Posted on October 29, 2014, in Postings. Bookmark the permalink. Leave a comment.